I always like to check whether I can trust people’s opinions by asking them if something I say sounds stupid. And if they say the stupid thing I said isn’t stupid, I know they can’t be trusted. Except with this literal sweat shop idea I came up with while writing this. I kind of like it. The Sweat Shop®. 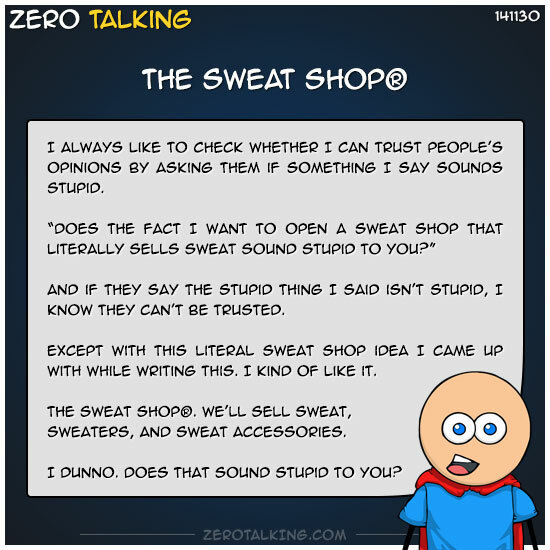 We’ll sell sweat, sweaters, and sweat accessories. I dunno. Does that sound stupid to you?